The B.C. Ministry of Health provided another update (Mar. 31) on the measles outbreak in Fraser Valley (Abbotsford, Mission, Chilliwack, Agassiz, Harrison Hot Springs and Hope) in British Columbia, Canada. 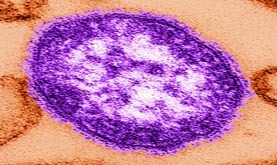 The current measles outbreak began March 8, 2014. This outbreak in regions of the Fraser Valley (Abbotsford, Mission, Chilliwack, Agassiz, Harrison Hot Springs and Hope) is now entering its fourth week. There are now cumulatively an estimated 320 cases. However, the spread of the virus into other communities has been limited. The level of risk to British Columbians outside of these communities is currently considered to be low. SURREY – Thanks to the leadership of chief medical health officer, Dr. Paul Van Buynder, the team of dedicated health-care providers at Fraser Health Authority and the increased uptake of vaccination, the current measles outbreak has been largely contained to the eastern regions of the Fraser Valley and members of that community. Since the outbreak was declared on March 8, 2014, Fraser Health has worked with schools, community groups, church groups, public health nurses and medical officers to investigate the outbreak and implement control measures such as setting up dedicated immunization clinics in public health and physician offices and urging people to get vaccinated. This current measles outbreak in regions of the Fraser Valley (Abbotsford, Mission, Chilliwack, Agassiz, Harrison Hot Springs and Hope) is now entering its fourth week and while there are now cumulatively an estimated 320 cases, the spread of the virus into other communities has been limited. The level of risk to British Columbians outside of these communities is currently considered to be low. The measles outbreak is expected to continue for another two weeks as the second and third wave of the disease makes its way through the communities. Anyone who has symptoms or suspects they have contracted measles is encouraged to stay home until the symptoms are over. Fraser Health will continue to update the public on the progress of the disease and B.C.’s provincial health officer, Dr. Perry Kendall, will provide additional updates as the need arises or as additional information becomes available.